17200-MP 83660 Deluxe Friction Sway Control Kit - This Sway Control is designed to work in conjunction with a Weight Distribution Hitch. The Sway Control reduces the lateral movements of the trailer caused by the wind. Friction Sway control bars give you a smoother tow with less sway. 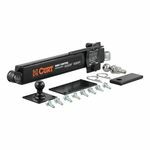 Kit includes: 1 Sway Control Unit, trailer mounted attachment ball with hardware, hitch mounted attachment ball, weld-on tab to adapt for left-hand use or for use without weight distribution hitch, mount reinforcement plate, and attachment clips. The Sway Kit has a durable EVERGLOSS Powder Coat finish that resists rust and corrosion. (Weight distributing hitch is not included.) The Sway Control Kit is backed by Curts Lifetime Warranty. Do not use this on a Class I, II or 2.5 hitch or with surge brakes.